If marketing and sales departments want to get firing on all cylinders, they need to work together. While the two groups have a reputation for not getting along, they at least need to be polite if they want to succeed. But guess what? The sales department is one of the best resources for the marketing team to create and visualize new ideas! Whether it’s blog posts, white papers, special reports, or internal content activation kits, the sales department is a wealth of ideas and content. Here are five ways marketers can get that valuable information from sales to make their jobs easier, help the sales department get better leads, and help everyone earn those annual bonuses for outstanding performance. 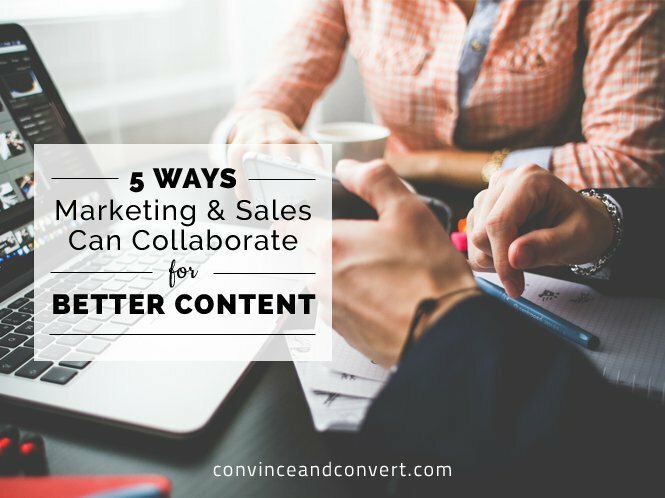 The marketing manager and sales manager should be meeting together anyway, but if you’re not, start doing it. Discuss the different issues each group is facing and how you can help each other. Also, give a heads up about some of the issues you’re each seeing that the other should be aware of. For example, the sales manager could talk about a sales objection or industry problem they’re frequently hearing from prospects. Marketing can then write a few blog posts about it, conduct a study, or release a white paper, as a way to overcome those objections before they’re even raised. One of the best ways marketers can learn how to respond to customers’ wants and objections is to work in the sales department for a few months. Since that’s not realistic, have them sit in on a few salespeople’s calls instead. Let them listen to what the customers ask, what the salespeople tell them, and learn some of the common issues. Develop new content to answer those questions and put the most frequent objections to rest. You’ll help the customer decide what they want before they ever make that initial contact. This also helps prospects self-identify what they need, which in turn qualifies them and moves them further down the sales funnel. Invariably, customers will email questions that start with, “How do I… .” This is a perfect source of content ideas. Not only can they be turned into blog posts, but if some of them run along the same theme, they can be turned into small ebooks. Since most content marketing is about persuading people through education, what if people could read a small book that would tell them how to solve their own problem? Ask the different customer-facing teams to send you those “How Do I” emails, and build an editorial calendar around those issues. Every sales rep has stories about good and bad calls. Everything was working right, firing on all cylinders, or nothing went right, and nothing they said seemed to make a difference. Talk to them, find out what the customer asked, and what the rep said. Was there anything that helped close the deal or convince the other person to commit? Can you replicate that in your written content? Since the sales reps make dozens of calls in a week, they’ll have a good sense of what works and what doesn’t. Their best calls will come as they make more and more of them. Now, let me be clear: There isn’t a person in history who won for being creepy. Slightly creepy might be okay, but really creepy is too much when it comes to checking out your competition. Every good salesperson knows (or should know) what the competition is doing. Turn that competitive intelligence into useful content. Create content that highlights your positives and their negatives. You may even want to go so far as to download some of their own content marketing materials and see what they’re doing. Use it to get ideas about what you could create, but don’t plagiarize or violate copyright. Use it for inspiration to get your own ideas rolling. The sales department is a veritable fountain of great ideas, so the marketing department needs to work closely with them to tap into a never-ending resource. Work with them rather than viewing them as a rival. You both have the same goal, and by working together, you’ll achieve it faster. Kyle is responsible for building content and marketing strategy around all things OpenView. Prior to joining OpenView, Kyle led the global content marketing team for ExactTarget and the Salesforce Marketing Cloud. His team managed the creation of content in six countries and over $15M in pipe a quarter. He is also the author of three books, Twitter Marketing for Dummies, Branding Yourself, and Social CRM for Dummies.